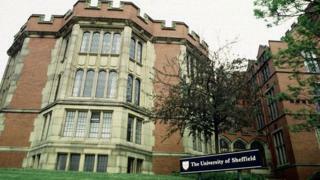 Final year economics students at Sheffield University are furious after an exam this week contained questions they found "impossible". The paper, on the economics of cities, contained compulsory questions on topics they had never been taught, say the students. More than 90% of those who took the exam have now signed an online petition demanding the university investigate. The university said all questions were based on topics taught in the course. But, in a tweet, one candidate complained: "Question three may as well have been in Chinese." Another asked: "How can they write a paper and include questions on something we haven't been taught, or told to research?" Just over 100 students took the exam on Wednesday. Almost all of these have now signed the petition. They fear getting poor marks in this exam will damage their final degree results. One student told BBC News she was particularly angry about the first question which contained mathematics for which, she said, they had not been prepared. "We had been told it was not a maths-based paper. "We feel misled and angry. "Every part of the question was, 'Calculate this, partially differentiate that.'" On top of that, in the second part of the paper, students had to choose to answer two out of three questions - but claim one of these was on a topic that had not been included in lectures, reading lists or revision papers. "It was completely alien to us. We had never seen it before and had never seen the terms it used," said one. Another said it was "completely unfair... impossible to do". This meant there was no choice, students had to answer the other two questions. Even this was not straightforward as one of the remaining questions asked candidates to compare two economic studies, one of which had not been part of their course. On Twitter, students called it an "absolute disgrace", "an exam from hell", "unethical", "poorly set and horrible beyond words after sleepless nights". As well as students taking a BSc in economics, the paper was sat by students taking a joint BA honours with other subjects, such as politics. The joint honours students were particularly badly affected as many lacked the mathematical background of the BSc students. The university said an internal review was under way and the results would be fed back to students. The head of the economics department, Prof Andy Dickerson, said not all the questions were mathematically based. "Those that had mathematical content were set at a level consistent with the maths taught to all economics students, including those on dual degrees. "All questions were based on topics taught in the course and for which further reading was provided. One question used a term that they may not have encountered previously, but to avoid any misunderstanding, the term was defined precisely in the question in terms of concepts used in the module." The department also said the exam would be second-marked internally and moderated by external examiners. "All module marks are compared across modules at each level to ensure comparability. "If there are large discrepancies, adjustments are considered by the examination board."